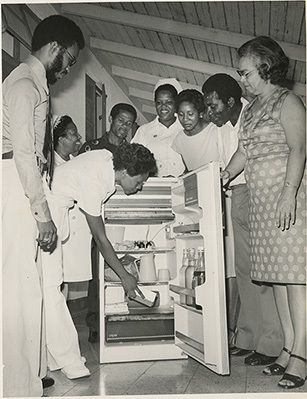 "REFRIGERATOR FOR CARDIAC DENTAL CLINIC: Nurse Audrey Rhooms, Dental Nurse at the Cardia Dental Clinic - National Chest Hospital - [2nd left] bends forward to stock the 7 cu. ft. refrigerator that had just been presented to the clinic by Colgate-Palmolive Co. [Ja.] Ltd. The refrigerator, which is being used to store dental drugs and filling material, was donated by Colgate as part of the company's on-going aid programme to the Cardiac Dental Clinic. The clinic was officially opened in October 1976, after a donation of $16,500 by Colgate, towards the refurbishing and equipping of the clinic. Others, from left: Lascelles Ellis, of Colgate's Administrative Department; National Chest Hospital Matron Carmen Brooks; Hospital Attendant Lester Mitchell; Nurse Dorrett Williams, Registered Nurse in charge of the Dental Clinic; Colgate's Rose Phillips; Hospital Administrator Justus Salmon; and Dr. Muriel Lowe, Senior Medical Officer of the Hospital." Herbie Gordon (Daily News), “National Chest Hospital - gift,” National Library of Jamaica Digital Collection , accessed April 20, 2019, https://nljdigital.nlj.gov.jm/items/show/5283.